This is catch up–My mom turned 85 on Feb 1, 2008. Her time in the Nursing home is so hard on her. She cries all the time and is afraid of everything. She is now having a hard time swallowing food of any kind. She mostly drinks. She was having a really weepy day, this visit. Something that is quite frequent with her. She is pretty much incoherent now. Some times she says one or two words that are understandable and occasionally make sense in the context of of the moment. Mom, August 18,2006, originally uploaded by lal3509. B and I went down to Decatur to visit Mom yesterday. We left Joliet around 7 am and made great time. Terry had gone to pick her up at the nursing home so she was at his house when we got there. The top picture I took right away after getting there. She is a bit worse, she knows me, in as much as she knows I am someone she cares about, but my name, no-what the relationship is,no. And something sad happens when she asks you to explain who you are-which she will do. She just cannot comprehend our relationship, as she totally cannot fathom that she was ever married. ON ONE LEVEL. She did however spot an old wedding picture of her and my dad and piped up,”there is a picture of Toney and me”. So it is too confusing. Part of the day she just talked nonsense and the rest she asked the same questions, or made the same comments over and over again. Physically she is doing ok, with the exception of her feet. She has diabetic neuropathy, and while her diabetes is under-control and she doesn’t have to take medicine or insulin, the disease has taken it’s toll on her. She has some ulcers that must be cared for by a podiatrist-get this-medicare will only pay for part of her care because she doesn’t take diabetes medicine. Mood wise, she is pretty good. 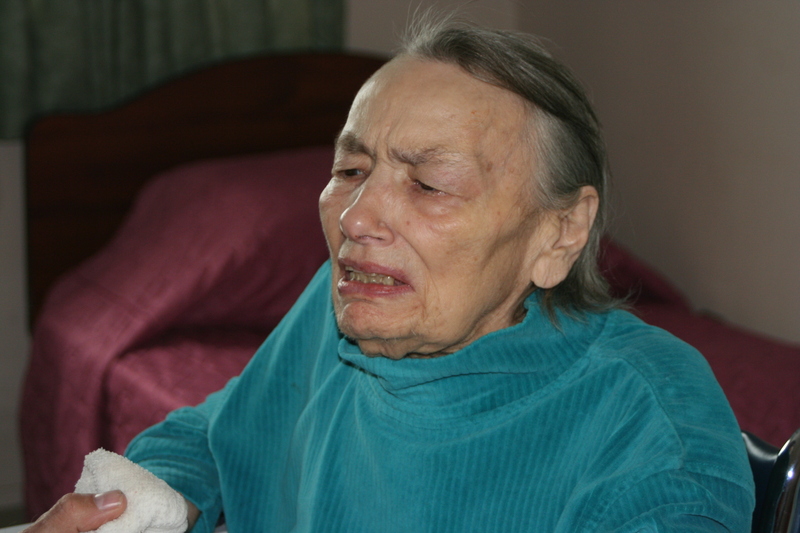 She gets kind of weepy at times, and worked up when we got ready to go back to the nursing home. But they won’t continue to medicate her like she was at first, because it is not in her formulary and there is no generic. Terry says it costs a $50 co-pay and she can’t afford to be on the medicine all the time. It is only used PRN.When she gets very agitated, and fortunately that is not often. We had a great visit. Went out to lunch and Mom ate like there was no tomorrow. Terry & Chris and I talked ourselves out I think. I can never repay my wonderful brother and his wife for all the care and concern that have given my Mom. Terry goes over nearly every day after work, and takes Mom out some weekends. They do her laundry and generally advocate for her. Terry has stepped up and done so much for our Mom. He has been my shoulder and strong rock to lean on. I really love my brother. Below, after I curled and combed out her hair and lipstick on her. Mom, originally uploaded by lal3509. This is my 83 year old mother. The picture was take a few days ago, it was her third day at the new nursing home . She is on a floor just for Alzheimer patients. She looks great because the first thing she asked me for is lipstick. That much of her is still present. Her pride/vanity in the way she looks. I will know when she is no longer inside her mind when she fails to take notice of how she looks. For the past 6 months or so she has been so anxious, and finally the doctor gave her some medicine that really mellowed her out. No more fear and nerves. She just smiles and seems so calm.